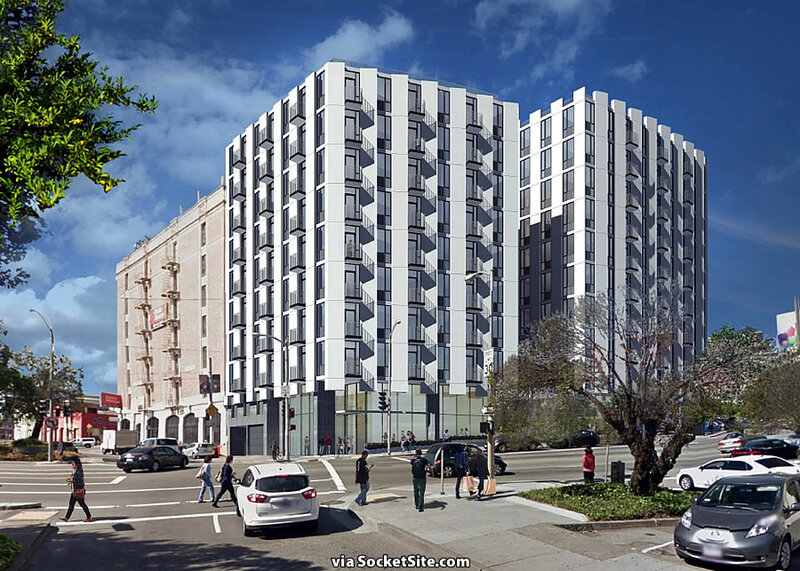 The supersized plans for a 10-story building to rise up to 105 feet in height upon the shuttered Lucky Penny site at the corner of Geary and Masonic have been abandoned. 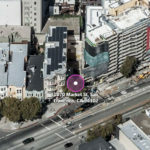 Instead, the project team is back to pushing forward with plans for an 8-story building to rise up to 80 feet in height upon the site, with a total of 95 apartments – a mix of 64 studios measuring 344 square feet; 29 two-bedrooms maxing out at 811 square feet; and 2 three-bedrooms averaging 950 square feet – over 1,760 square feet of retail space, a garage for 16 cars and secured parking for 120 bikes as newly rendered by RG-Architecture below. The entrance to the development’s garage would be by way of Geary Boulevard and a 5,600-square-foot roof deck, and two interior courtyards, would provide open space for the building’s residents. While the proposed 8-story development would conform to the existing 80-foot height limit for the site, its 95 units are nearly five times as many as the parcel’s existing density limits would allow (21). But the passage of a spot-zoned Special Use District (SUD) would allow the 95-unit project to proceed, in exchange for which the currently grandfathered percentage of Below Market Rate (BMR) units required for the development (14.5 percent) would be raised to 23 percent. Of the required 22 BMR units, however, four (4) could be priced to be affordable to those making up to 110 percent of the Area Median Income and another four (4) could be priced for those making up to 120 percent. 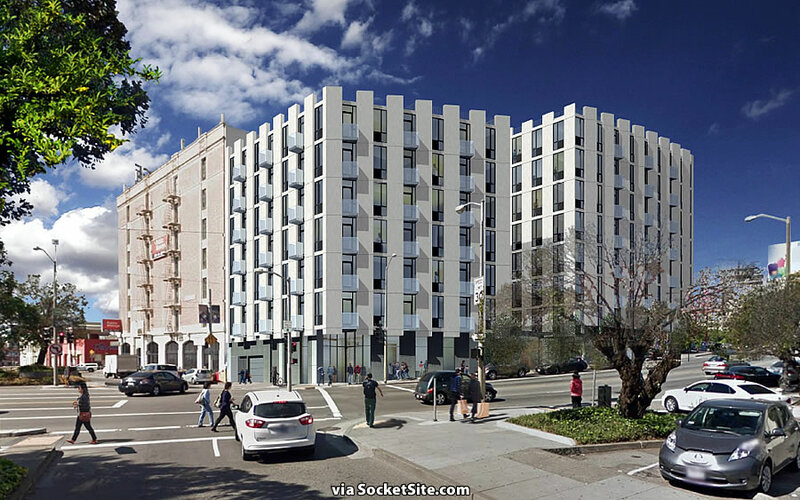 And next week, the re-sized plans and required SUD necessary for the 2670 Geary Boulevard project to proceeded are slated to be approved by San Francisco’s Planning Commission. At least something’s getting built. Disappointing to see the size reduced and 36 affordable apartments reduced to 22. That’s 14 families who won’t get to live in the city. I heard through back channels that a local neighborhood association was threatening to sue over the height, necessitating this downsizing. If true, appalling selfishness on their part. It looks better at 10 as well by holding the corner. Only in SF would there be pushback of such a minimal density increase. Geary is a wide, heavily trafficked boulevard right? Not a quaint side street. That corner is visible from far away; I’m glad the building was downsized a bit – otherwise the building would stick out from afar. The next 14 families that get Ellis Act evicted while still on the waitlist for permanent affordable housing, I’d like you to look them in the eye and explain how pleased you are with how this corner looks from a distance. All of these individual decisions to not maximize housing have a real effect on real people. these are studios!! not family apartments. Happy to do so. The needs of the many outweigh the needs of the few. By your reasoning, we should just build enormous eyesores everywhere until every person who wants to live in San Francisco is housed, the quality of life be damned. A roof over one’s head is a need. Your subjective aesthetic preference is not a need. for one, i disagree on the basis of more homes is more important than one person’s design opinion. for two, i think your design opinion needs work. we should not be protecting the prominence of old public storage buildings that will likely be demolished sooner rather than later. by your logic, our city would literally be “racing to the bottom” – every building needs to be shorter than the one next to it, thus driving down the size of every new building, the logical conclusion of which is of course massive under-building. I know many will disapprove but that corner is perfect for an electronic billboard. At least some sort of “art” that could be illuminated at night. Either way build it! Three bedrooms in 950 square feet? Just like in Paris. Who doesn’t like Paris? It is quality over quantity. Yes, people like Paris, and that neighborhood is absolutely nothing like Paris. Nor does the proposed development seem to be of high quality. paris wasn’t built in a day. also, why do you say the development is not of high quality? you have no evidence to say that. also, building built these days are almost too high quality, given stringent energy and environmental regulations. so much so that few projects are even feasible. That roof deck better have any furniture well anchored down. Although the lower version may get some shelter from the storage building, the winds tend to howl around there. Speaking of Masonic, when is that project supposed to wrap? Every time I’ve ridden past there along the Panhandle it looks like it hasn’t changed in months. *Referring to the Masonic streetscape improvement project. 95 apartments for people who will need to afford the rent of $3500-6000+ a month but yet only 16 parking spots for the whole project. San Francisco’s war on the automobile is almost complete. Is everyone supposed to take a corporate bus or Lyft or Uber to work or am I missing something? This’ll be a stop on the Geary bus rapid transit by the time the units are occupied. Try the 14/14R/49 in the Mission for a preview of just how speedy and convenient a bus can be, you’ll be surprised. i feel like i say this almost weekly — 30 minute bike to work downtown (dream come true for me), next to a robust and growing tranist corridor, near ample institutional and commercial resources, walking distance to the best park this side of the mississippi … i’d love one of these apartments without a parking spot – and i’m not alone. I think the project timing along with an oversupply of rentals is the reason for the downsizing. There should be sufficient workforce housing demand from the nearby Kaiser Hospital. Workers could take the 38 Geary bus to get to work or walk. Looking the diners’ ID badges at Panera (inside the Target store complex across the street) on a weekday afternoon, quite a few worked at Kaiser. oversupply of rentals? can you cite that or are you just truly nuts? It’s not being downsized due to an “oversupply of rentals”. It’s likely being downsized in order to lower the construction cost per dwelling unit. If they make the topmost occupied floor level lower than 75 feet, the building is not subject to the (substantially) more expensive “high-rise standards” of the building code. Those are pretty tidy dimensions for studios, and it’s also odd to have no 1BRs in the mix, isn’t it? Hard to justify giving up 2 additional floors of badly needed housing because . . . why exactly? so much talk about “building housing” and “fighting nimbys” and so little to show for it. I live nearby and that corner is already clogged with traffic. Add in more people crossing against the light (I see it daily) plus the development 2 blocks up on Masonic in Laurel Heights, it is going to be a nightmare for drivers and buses alike. I wish it wasn’t going to be housing and instead an expansion of the Trader Joe’s parking lot, which cars line up for blocking an entire lane of traffic and people illegally cross busy Masonic for. There was one crossing casualty and I’ve seen people nicked by cars or causing accidents doing that. Or instead of using traffic (which you admit is already bad, so this project didn’t cause it) as an excuse to block new neighbors, we could invest in solutions. Like, say, the Geary bus rapid transit that could be stopping on this corner already if it hadn’t faced so much shortsighted opposition. The bus stops across the street in both directions so that isn’t an issue… this is a congested area that needs to be addressed as such with a very popular grocery store (TJ’s) and close future devolvement on the map. To quote a corporate cliche, “acting vs reacting” needs to be done. Under your proposal, the TJ’s car queue would still exist, only it would feed into a larger parking lot. Maybe TJ’s could move across to the street to the Mall and its current site could be converted to housing. Or the e/s on-street parking on Masonic north of Geary could be removed. Yes, TJs should move across the street to the shopping mall and they should build housing on the TJs site. Love it. I wonder if the city could do something to make these types of swaps easier so we could build up on current one-story retail without losing the stores. It makes so much sense, but seems to rarely happen. There was talk of such a swap with the Excelsior Safeway and the new development next to it… so far just talk. How exactly does 95 units of much-needed housing (with a mere 16 car-parking spaces) make “traffic worse”? You want to make “traffic better”? — get out of your car and walk/bike/take-public-transport. It’s absolutely beautiful. One of the most beautiful buildings that I’ve seen proposed in the City in the last 10 years. Lol, you stole my line. Disappointing design for such a visible corner. Pretty bland allover. We’ll take that bet. Roughly 60 percent of our readership, which runs around 200,000 unique visitors (versus visits) a month, is from San Francisco proper, followed by Oakland, New York, Los Angeles, San Jose, Palo Alto, San Rafael, Mountain View, Berkeley, South San Francisco and Chicago, at least in terms of domestic traffic in the absolute.